Issue 54 split covers celebrate two scenes - blue-eyed soul and Brooklyn MCs - brought together as only Wax Poetics can. Cover one sports legendary Brooklyn MC and Juice Crew alum Big Daddy Kane, backed with new Brooklyn mic killer Joey Badass. And we venture farther back in time to speak with the elusive old school BK rapper Jimmy Spicer. Cover two features the poster boy for the blue-eyed-soul movement, Daryl Hall. Wax Poetics digs deep into the scene with features on Bobby Caldwell, Donald Fagen of Steely Dan, Laura Nyro, and Ned Doheny. Juice crew alum Big Daddy Kane remains true to the art of hip-hop. a consummate entertainer, Kane witnessed the blossoming of the culture during the golden era and set a high standard for future mcs. never one to take his gift lightly, the legendary Brooklyn mc uses his music to touch the lives of his fans beyond the dance floor. Daryl Hall cut his teeth on the local Philly music scene under the tutelage of soul masters including the Temptations, Thom Bell, and Gamble and Huff. after serendipitously landing on the same bill as John Oates, the two became quick friends and soon began working together. after reaching sky-high success in a duo with Oates, Hall has settled into a new role as internet music-TV pioneer with a new monthly web series that brings the world into his home. 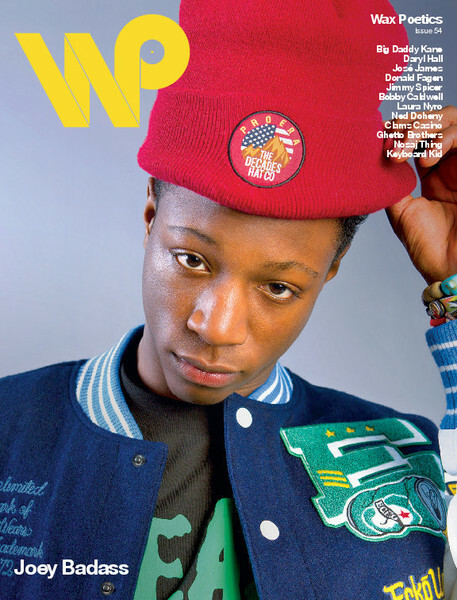 Joey Badass is the future of hip-hop. at only eighteen, he possesses lyrical poise rarely on display in this modern era. Last year, he dropped his debut mixtape 1999 to critical acclaim, showing a penchant for classic new York hip-hop sonics and potent verbal wordplay. along with his Pro Era crew, Joey Badass brings skills back to the game while ushering in a new age of consciousness. Infusing vocal jazz sensibilities with hip-hop swagger, José James is in a space all his own. though a Brooklyn resident, it took a trip to London with a bag of self- pressed vinyl to put him on the radar—thanks to Gilles Peterson who signed him to his Brownswood label. now with Blue Note, James drops a multi-layered album that is modern, progressive, and classic all at the same time.